Epoxy garage flooring provides an opportunity for homeowners or shop owners to add a little style and character to a garage floor. However, it does much more than this. It can be the ideal investment for any space that gets significant traffic. Who can benefit from it? 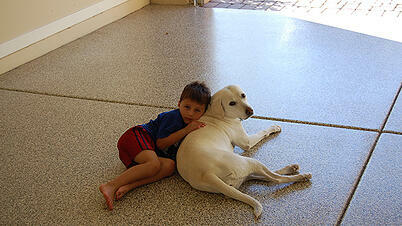 Epoxy garage flooring can be a beautiful addition to an otherwise-boring concrete floor. This type of coating, added over the top of an existing concrete slab, is available in numerous colors and styles. For the homeowner that wants a modern, clean look, adding a bit of color to the garage is a good way to achieve that. It is possible to customize the space using epoxy. Whether you've damaged your existing concrete garage floor already or you want to prevent this, adding a epoxy to a garage floor can offer outstanding protection. If you tend to work on cars in the garage, for example, a simple oil spill could cause lasting stains. This can make keeping a clean, neat garage tough to do. However, epoxy coating provides a layer of protection to the surface. In fact, it is easy to keep clean, even from motor oil, stain, paint, and dirt. That makes the mechanic's job much easier. How many times have you dropped a tool and marred the floor as a result? In a busy workshop, whether it is a woodworking space or one for trinkets, floors are often at risk. However, epoxy garage flooring works to minimize this. As a damage-resistant floor, it ensures that, no matter how brutal you are to the floor, it is protected. If you are selling your home, you've likely made changes to the space to encourage home buyers to make an investment. Epoxy flooring should be one of them. It can easily cover up a cement floor that's discolored or marred. It works very well to create a like-new floor in just about any space. Unlike other flooring materials, including replacing a cement slab, epoxy garage flooring is an affordable choice. It is easy to maintain, lasts for a long time, and adds value to the home. For all of these reasons, adding it to your garage makes sense. No matter what you do or don't do in your garage, a new floor using epoxy may be exactly what you need to transform the space. Even better, it is not difficult to install, especially when a professional installs it for you. 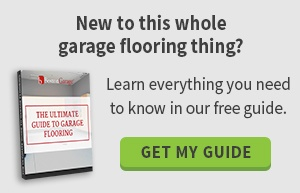 You'll find this could be the only time you have to think about your garage floor for years to come.